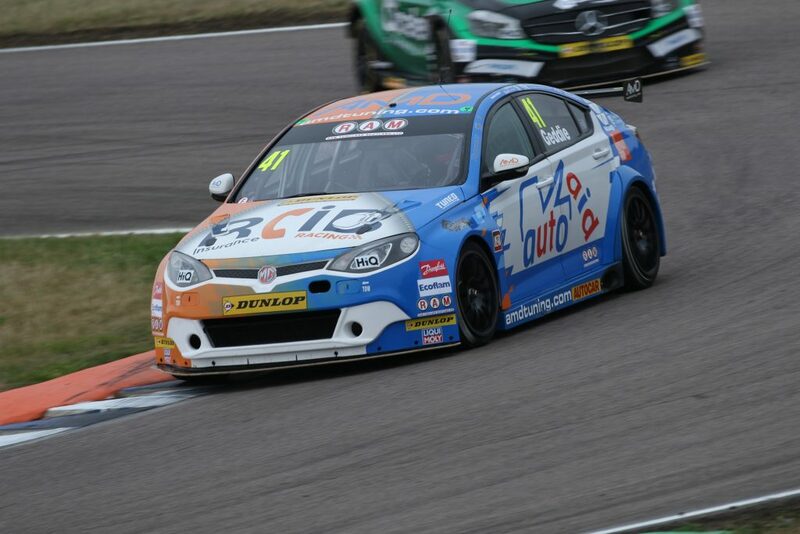 The AmD with AutoAid/RCIB Insurance Racing team secured a hat-trick of top ten finishes from a strong weekend on track as the Dunlop MSA British Touring Car Championship headed for Rockingham for the seventh round of the year. 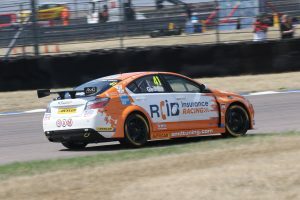 The West Thurrock-based team was keen to bounce back from a tough weekend at Snetterton where a single top ten finish didn’t reflect the pace in the team’s MG6 GT, with all-Scottish driver pairing of Rory Butcher and Glynn Geddie keen to impress. 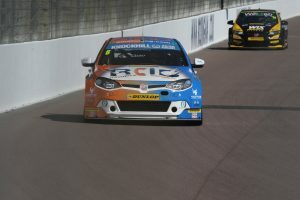 Fife racer Rory led the MG challenge in qualifying with the 20th best time, with the close nature of the grid being reflected by the fact that his time was just six-tenths of a second off pole position. Come Sunday however, Rory was able to show the race pace in the car with a starring drive in the opening 18 lap encounter that saw him work his way through the field to take ninth spot on the very last lap. Although he briefly dropped outside the top ten in the early stages of race two, Rory was soon fighting his way forwards once again and crossed the line in eighth spot which secured a second row start for the final race thanks to the reverse grid draw. Running a strong second early on, Rory diced with championship leader Colin Turkington over third place before a small error at Deene saw him run wide and slip down to sixth spot, which is where he would ultimately finish for a third top ten result of the weekend. Team-mate Glynn went into the weekend carrying an additional 45kg of ballast as a new entry and without any prior running in the car, which played a part in him qualifying in 30th place. The Aberdeen racer ran well with the extra ballast in race one to finish 22nd and then repeated the result in race two after finding himself dicing on track with the Honda of Dan Cammish late on. The former British GT champion briefly got himself up into the points in the early stages of race three but having been demoted back to 21st place, he brought the car in to retire as a precaution when a warning light appeared on the dashboard. “I’m really pleased with how the weekend went and it was a good way for us to bounce back from the disappointment of not scoring at Snetterton. After such a tight qualifying session, I felt confident that we could race forwards as we have had a strong race car throughout the season – and that proved to be correct. “It was all about making sure that we stayed out of trouble at the start of the races, particularly in the mixed conditions, but I think I drove well and felt in a good place going into race three. I was determined to try and get to the front early on but perhaps took a bit too much out of the tyres and was struggling for grip. “I think it’s been a good weekend for me on my return to the series. Carrying ballast as a new entry was always going to make it tough, but I think we made good progress across the weekend. “Race two in particular was good once we had the weight taken out, and the car was transformed from where we were in race one. I was able to push a lot more and made good progress in terms of my pace, which is something I can take a lot of confidence from considering how long it is since I last raced a front-wheel drive car. “It’s been a great weekend for the MG side of the team. We showed strong pace throughout race day and the results we have picked up here are the kind of results we could have had at Snetterton with a bit more luck on our side. “To pick up three top ten finishes is a fantastic performance for Rory, who has driven really well, and I think Glynn can also hold his head up high considering it was his first time in the car this weekend.